(1) Joab, great-great-grandfather of Nathan, the author of the 'Aruk (second half of 10th cent.). (2) Joab b. Solomon b. Abraham (1166), great-great-grandson of No. 1. (3) Joab, grandfather of Paola, descendant of No. 1. (4) Joab b. Benjamin b. Solomon (1280-1304), grammarian and Biblical exegete in Rome. (5) Joab b. Solomon b. Shabbethai b. Mattithiah, father of Menahem, in Rome (about 1340). In the fourteenth century a synagogue of R. Joab in Rome is mentioned. Benjamin b. Joab: A writer of religious poems (Paris MS. 814; Zunz, "Literaturgesch." p. 365). Benjamin b. Joab Naḳdan: Grammarian and Biblical commentator in Rome. He is the author of a manuscript work dating from 1284, and is mentioned in another manuscript dated 1292. He was probably the teacher of the poet Immanuel b. Solomon. Jekuthiel b. Jehiel ( ): No less than twelve manuscripts of his have been preserved. Joab of Bethel: Synagogal poet of the fourteenth century. Whether he is identical with the religious poet attacked by Immanuel b. Solomon can not be determined. Zunz mentions three poets of this name. idem, Literaturgesch. pp. 501, 709. Baruch b. Solomon b. Joab: Lived in Larricia 1451. Bezaleel b. Baruch in Larricia: Son of preceding; flourished 1457-63. Ishmael Rofe b. Moses: Judge in Rome 1562. Jehiel (Ḥiel) of Bethel: Contemporary of Immanuel b. Solomon, who speaks of him as "one who is in Hades" ("Maḥberot," xxviii., ed. Berlin, p. 256). Joab b. Abraham b. Joab ( ): Writer in Tivoli 1333. Joab b. Nathan b. Daniel: Writer of synagogal poetry. Joab Raphael b. Benjamin, of Montesanto, president of the synagogue Quattro Capi in Rome, 1539-50, doubtless belongs to this family. Mattathiah b. Jehiel, of Pisa (14th cent. ; see Schorr in "He-Ḥaluẓ," ix. 50). Mordecai da Pisa b. Solomon da Camerino (1483). Shelumiel b. Jehiel, of Tivoli: Lived in Rome 1578. Abraham b. Joab Eliashib (1438). Baruch b. Joab: Member of the rabbinical board in Rome 1538-42. Benjamin b. Joab: Lived in Ravenna 1579. Eliezer Moses b. Joab (1463). Elijah b. Joab: Banker in Rome 1536. Elijah Melammed b. Joab: Lived in Rome 1524. Ephraim b. Joab b. Moses, of Modena: Writer and poet (1462); lived at Abruzzo 1481. 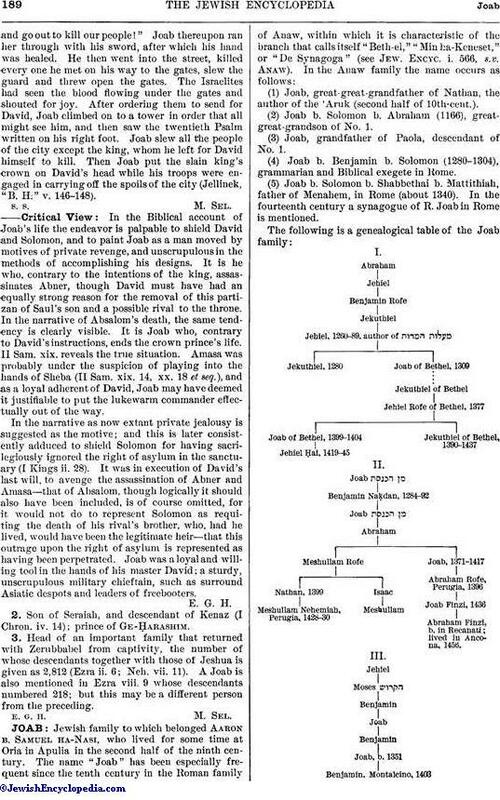 Jehiel b. Joab: Pupil of Shabbethai b. Solomon in Rome 1290. Joab: Teacher of Benjamin b. Abraham Anaw at Rome in the first half of the thirteenth century. Joab: Lived in San Miniato in the sixteenth century. Joab b. Abraham Finzi (c. 1660). Joab b. Baruch Lampronti: Lived in Ferrara about 1730. Joab (Dattilo) b. Baruch degli Piatelli: Teacher in Rome; supported Joshua Menaggen's efforts and defended Jacob Ẓahalon's writings. He wrote introductions to two works by the latter which appeared in Venice in 1665. Joab was rabbi of Sienna at the time of his death. Joab b. Benjamin: Lived in Rome 1555. Joab b. David: Copyist and writer of synagogal poems (c. 1426). Joab Elijah b. Joab (1483; see R. Judah Minz, Responsa, Nos. 2, 3). Joab Ḥazzan: Writer of synagogal poems. Joab b. Jehiel, of Modena. Joab b. Jekuthiel, of Tivoli (1414). Joab b. Joseph, of Modena (1495). Joab b. Maẓliaḥ de Ceprano: Son of Maẓliaḥ b. Menahem Ceprano; lived in Rome 1575. Joab Melammed: Lived in Rome 1539; perhaps identical with Joab Fattore in Rome (1539) and with Joab Melammed de Recanati, who lived in Rome 1553. Joab b. Menahem Joseph (1460). Joab b. Mordecai Trioufo: Lived in Rome 1539. Joab b. Moses: Lived in Rome 1584. Joab b. Obadiah, of Tivoli: Lived in Rome 1599. Joab della Ripa (or of Larricia?). His widow, Fresca Rosa, died in Rome 1565 (Berliner, "Aus Schweren Tagen," No. 32). Joab b. Shabbethai: Lived in Rome 1499. Joab Shemariah, of Corregio (1503). Joab Valencin: Lived in Venice 1594. Joseph b. Joab Elijah (1461). Maẓliaḥ b. Menahem Ceprano: Lived in Rome 1562. Menahem b. Joab, of Ascoli (1479). Menahem b. Joab: Lived in Ferrara 1745. Mordecai b. Joab, : Banker in Rome; "fattore" of the Roman congregation 1536-38. Obadiah b. Joab: Presider in Rome 1554. Shabbethai b. Joab Calabrese: Presider and rabbi in Rome 1539-58. 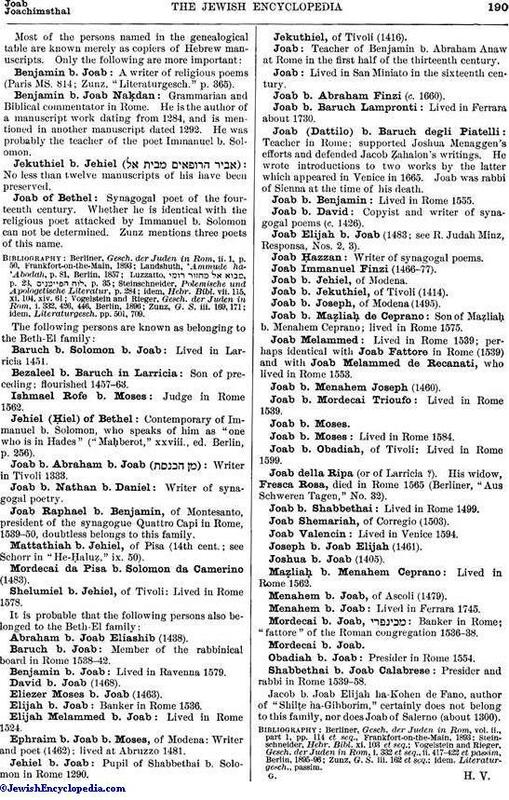 Jacob b. Joab Elijah ha-Kohen de Fano, author of "Shilṭe ha-Gibborim," certainly does not belong to this family, nor does Joab of Salerno (about 1300).